Automobiles play a big part in our lives. They not only can take us to the movies, the have played a large role in many films. Here is a list of five memorable automobiles that have had a starring role in cinema. Christine. Stephen King has made a very lucrative career out of creating monsters everywhere. 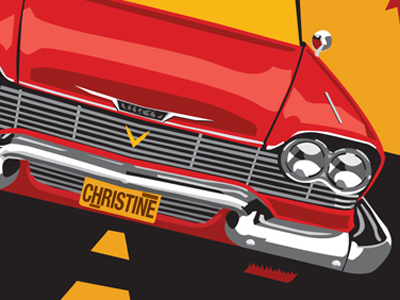 In his 1983 book and movie adaptation “Christine”, King turns his sights on a 1958 red and white Plymouth Fury. Arnie Cunningham buys the decrepit auto from a strange man who seems all too eager to sell the teen the car. Rusty, smoking, and barely running, Arnie begins to lovingly restore the car. Soon, the car begins to come to life in more ways than one. Christine and Arnie develop a relationship only the two of them fully understand and nothing will keep them apart. This includes family, friends and even a group of bullies. The movie proves that there is no Fury like a Plymouth scorned. The Love Bug. 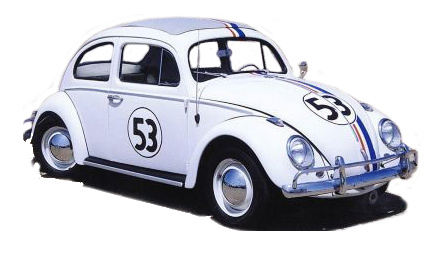 The Love Bug was a 1968 movie that starred Herbie, a 1963 Volkswagen Beetle. Once you get past the premise that this Volkswagen is a race-car, it is relatively easy to believe it has a mind of its own. The cinematic adventures that Herbie experiences in the movie include the VW beating up on a Lamborghini, going on a destructive romp of Chinatown and his attempted suicide off of the Golden Gate Bridge. This is a Disney film? Dean Jones, Michelle Lee and Buddy Hackett star in the film along with Herbie, who (spoiler alert!) finishes first AND third in the movies climactic race after splitting in two. Car Stars: The Love Bug. The DeLorean in Back to the Future. Before it became a popular choice for major appliances, stainless steel was the material chosen by John DeLorean for building his innovative but short-lived vehicles of the early 80’s. 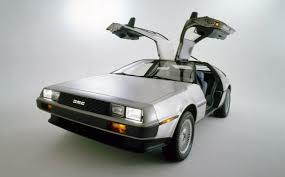 A 1981 DeLorean DMC-12 with its shiny body and gull-wing doors starred in this sci-fi/comedy with a young Michael J. Fox. Unlike some cars who have had large roles in movies, this DeLorean didn’t have a personality or come to life. All it could do was transport its occupants back and forth in time. An early scene in the 1985 movie features Libyan terrorists long before most of us ever heard about Libyan terrorists. Hmmm. Maybe there was something to that time travel thing. Car Star: The DeLorean in Back to the Future. 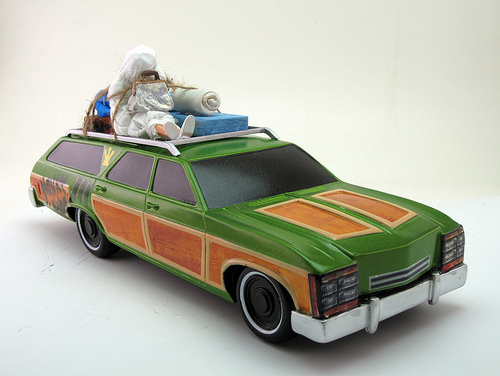 The Family Truckster in National Lampoon’s Vacation. Producers did nearly the impossible. They took a boxy, Ford LTD station wagon and made it even uglier. The putrid green vehicle not only sported fake wood paneling on its sides, but also on its hood. The front featured four sets of double headlights adding to its gaudy appearance. The car didn’t actually star in the comedy but it played a large role, serving as the Griswolds mode of transportation from their home in Chicago to California’s “Wally World”. The film was also the motion picture debut of Christie Brinkley. Vroom, vroom. The Trans Am in Smokey and the Bandit. A memorable cast of Burt Reynolds, Sally Field and Jackie Gleason add to the fun of this comedic classic with a 1977 Pontiac Trans Am serving as the Bandit’s vehicle of choice. In it, he races through the South, leading the way for a truck full of beer in an effort to win a bet. It was during the height of the CB (citizens band) radio craze. Makes you wonder how the movie would change if the bandit had a smartphone. 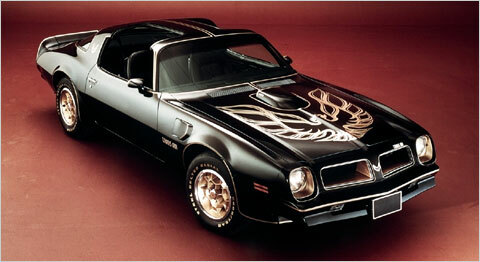 Car Star: The Trans Am in Smokey and the Bandit. How important are cars in movies? With the exception of Christine, all of the films listed above had multiple sequels. What is your favorite vehicle from a movie?